Employees are keeping it C.A.S.U.A.L. at Sundance Vacations to save lives! Sundance Vacations employees showed their support for the Northeast Regional Cancer Institute (NRCI) by participating in the charity’s C.A.S.U.A.L. Day during the week of March 23 – April 1, 2016. C.A.S.U.A.L. 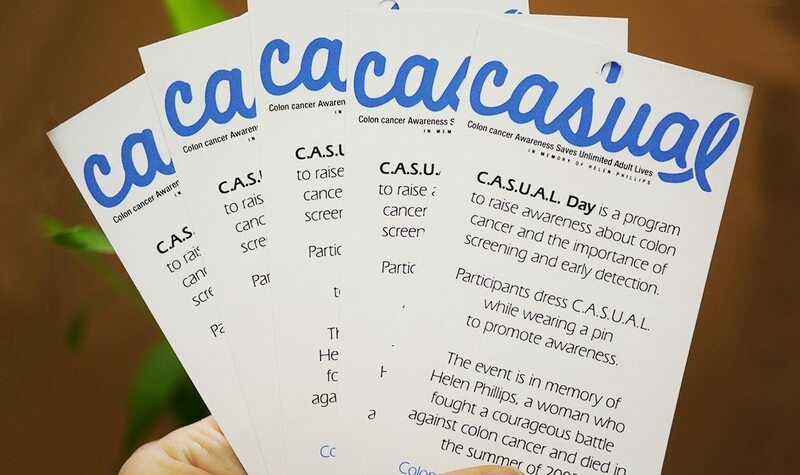 Day, an acronym for Colon Cancer Awareness Saves Unlimited Adult Lives, is the NRCI’s annual fundraising cause to bring awareness to Colorectal Cancer in Northeastern Pennsylvania (NEPA). 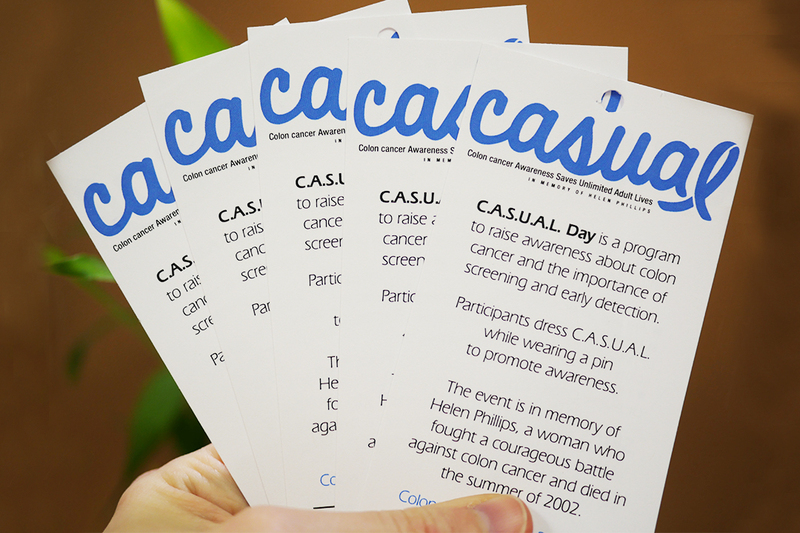 The NRCI shines a light on Colon Cancer for one special day each year by encouraging people to purchase and wear its C.A.S.U.A.L. shirts and pins to emphasis the importance of cancer screenings and early detection. 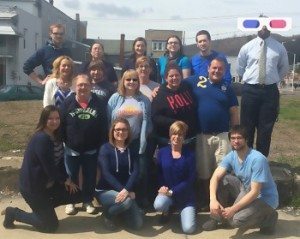 Employees from the Sundance Vacations Wilkes-Barre, Shamokin and Tamaqua, Pennsylvania offices put their own spin on C.A.S.U.A.L. Day this year! Instead of purchasing shirts and pins, employees donated $10 to dress down at work for not just one day, but an entire week. Our C.A.S.U.A.L. 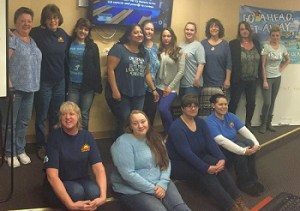 Week allowed employees to wear jeans, sweatshirts and other comfortable clothing to work during the week of March 28 – April 1. 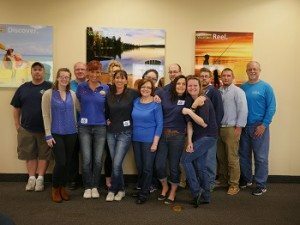 Sundance Vacations also encouraged employees to wear blue on Thursday, March 31 to recognize those affected by colon cancer and inspire others in NEPA to schedule a cancer screening. By the end of the week, Sundance Vacations employees raised over $600 to donate. In addition, Sundance Vacations co-founders, John and Tina Dowd, put another $250 in for the cancer institute. That means that Sundance Vacations employees collected over $850 to donate to the NRCI’s cause! Sundance Vacations Digital Marketing Coordinator Jennifer Villa organized our C.A.S.U.A.L. Day fundraiser with the help of our Charity Coordinator Kelly Valovich and is thrilled with the results. Villa said that she is always looking for ways to help those who suffer from cancer; her own aunt is a Breast Cancer survivor. All of the money raised by the NCRI’s C.A.S.U.A.L. Day stays in NEPA and is used to help people with cancer in the area. A portion of the donations gathered by Sundance Vacations employees will pay for colorectal screenings for low-income and underinsured people in Northeastern, Pa.
Karen Saunders, President of the NRCI, tells Sundance Vacations that in addition to the company’s help, the NCRI sold over 4,300 shirts and 4,000 pins for this year’s C.A.S.U.A.L. Day. Looks like a lot people in NEPA kept it C.A.S.U.A.L. for a good cause. 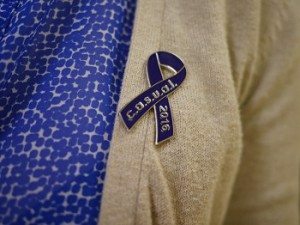 In fact, because of its many years of successful fundraising, the PA House of Representatives declared March 31, 2016 as C.A.S.U.A.L Day across the entire state. Sundance Vacations is proud to have been a 2016 C.A.S.U.A.L. Day Sponsor. The NRCI has been organizing C.A.S.U.A.L. Day for the past 13 years. Colon Cancer is one of the most diagnosed cancers in the Northeastern, Pa. area. 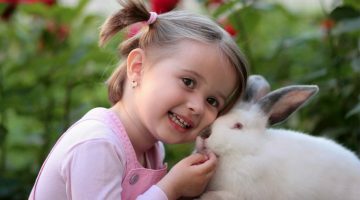 It is also a cancer that can be easily screened and in some cases prevented. Have a casual conversation about Colon Cancer with friends and family to spread awareness or go to the Centers for Disease Control and Prevention for more information. 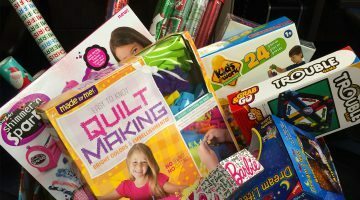 View all charities Sundance Vacations Wilkes-Barre worked with here: Wilkes-Barre News. View all charities Sundance Vacations Shamokin worked with here: Shamokin News. View all charities Sundance Vacations Tamaqua worked with here: Tamaqua News. Sundance Vacations has been sending travelers on the vacations of their dreams for 25 years. In addition to our travel services, our co-founders believe strongly in giving back and incorporate their values into the culture of the company. Employees are always lending a hand to those in need around all our offices . Read more on under our Latest News section. Kudos to the employees of Sundance Vacations. The fundraising and volunteers who work so hard to make a huge difference in the lives of people and animals alike. Everyone should take a hint from those who give of themselves unselfishly to make a difference for those in need. What a wonderful world it would be. Thank you to each and every one of you for making a positive impact on our world.